Applications for HSI 2019 are now closed. Please check back in September 2019 for information and applications for HSI 2020. By 2012, Nandan Sharalaya had won almost every debate that there was to win as an undergraduate at the Symbiosis Institute of Media and Communication, pursuing a degree in communication and journalism in Pune near Mumbai, India. International competition was the next natural step, and a university in Lahore invited him to compete. The proposed topic would be the Kashmir conflict regarding a border dispute that has continued since the great Partition in 1947—but with one twist: Nandan would have to argue Pakistan’s case, and a Pakistani team would be representing India’s position. Nandan couldn’t resist the challenge. Team selection met with resistance. Many of the debaters’ families feared a Pakistani visa stamp on a passport. “A simple stamp could affect their ward’s chances to secure a visa to America and Europe in the future,” Nandan says. “An American visa is often viewed as a sign of success and prosperity.” Once the team was in place, they trained, researched intensively, and practiced for weeks. Nandan learned that the Pakistani team also swam “neck deep in research,” which further excited Nandan and his team. His university expended formidable sums advertising this significant debate. A week prior to the event, however, the team’s visas didn’t go through. A contest that could have advanced international diplomacy, disappointingly failed to take place, but international communication and exchanges were to become increasingly vital to Nandan. At Symbiosis Institute (SIMC), he soon became an intern with the Society for Assistance to Children in Difficult Situations (SATHI). As camp coordinator and counselor, he focused on fighting addictions in young children and aiding runaways who settle on India’s railway platforms. According to Nandan, parents often fixated on grades; teachers perpetuated obsolete methodology; and administrators focused on increasing revenue. He continued to develop theoretical knowledge at SIMC while also gaining experience through internships. A Bangalore hotel interested in social responsibility brought Nandan in to coordinate a blood-donation camp, computer training, nutritious mid-day meals for disabled children, fund-raising, and employment generation. As an intern for an Indian news magazine, Nandan assisted in investigative journalism. He also interned in Mumbai for three months with CNN-IBN. 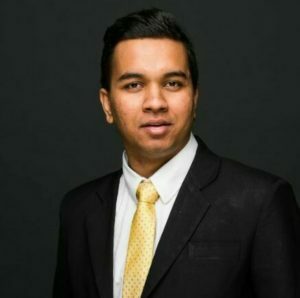 Nandan wrote an essay sponsored by the Loyola Institute of Business Administration in India, focusing on mindful leadership, innovation for a sustainable world, moral challenges, and “the intersection of economic growth and responsible development.” Nandan received a cash prize and a National Bronze Metal. He was also selected as one of forty fellows out of over 1500 applicants by a legislative think-tank that runs the prestigious Legislative Assistants to Member of Parliament (LAMP) Fellowship. After graduating in 2012, Nandan had planned to pursue his master’s degree, but the LAMP offered him the opportunity to work for a first time Member of Parliament (MP), Dr. Ajoy Kumar. “Fresh out of college, Nandan was a bit of a legislative wonk!” says Dr. Kumar. Nandan immediately rebuilt the MP’s website, making it interactive and transparent. He carried out legislative research “on a host of economic and social issues, which I have extensively quoted on the floor of the house,” writes Dr. Kumar, boosting his measurable effectiveness by almost twenty percent. Nandan also developed projects in Jharkhand, India’s most backward tribal state: “Ponds for Livelihood,” the successful silt removal in two-hundred ponds at a surprisingly low cost, commended by Bill Gates and the London-based think tank, Chatham House. Another initiative brought a medical helpline that provided free treatment to 500 patients a day by “institutionalizing it under a smart appointment process,” according to Dr. Kumar. At the end of the LAMP term, Dr. Kumar wanted Nandan to continue through the summer, planting 100,000 saplings, not only beautifying the city of Jamshedpur, but also addressing two causes Nandan considered vital: climate change and sustainable cities. At the same time, Indian President Pranab Mukherjee’s Press Secretary asked Nandan to work there for the summer. Torn, Nandan chose the trees, adding Go-Green programs to some 4,000 youngsters, to great success. In the fall of 2013, Nandan was off to England at the School of Oriental and African Studies (SOAC), University of London, pursuing the Interdisciplinary Masters in International Economics, Energy, and Climate Policy, and International Law in an International Studies and Diplomacy (ISD) program. Upon completing it in 2014, he planned on getting his PhD, but India underwent a major political change. Prof. Rajeev Gowda had just been elected to the upper house of the Indian parliament, but his party had suffered a huge loss and needed strengthening. Prof. Gowda and his party strategized, relying on a research unit that could hold the government accountable on every legislative issue. He hired a young man who came highly recommended—Nandan. As the new Lead Parliamentary Analyst, Nandan was tasked with building and managing an advocacy team. After eight months, he was promoted to manage teams from both houses of parliament, one in New Delhi and one in Bangalore, responsible for the output of up to fifteen policy researchers and over a hundred interns, and consulting with 110 Members of Parliament, achieving a great degree of success in setting informed policy agendas. Utilizing his knowledge, Nandan founded Decent Neta, a unique online opinion portal on politics and policy in India. Prof. Gowda says, it “provides a fair, unbiased and critical view of the Indian political domain. The portal is doing well and drawing accolades.” Nandan also contributes a fortnightly blog for the Huffington Post, and his writings have appeared in several national magazines. He and Prof. Gowda have co-authored a chapter on “crony capitalism” and corruption in the professor’s book, a chapter which helped frame a well received amendment to the election expenditure laws. Nandan is often a visiting faculty member in several media and policy schools in India, promoting grassroots education for both urban and rural entrepreneurs, helping to design solutions that are cost-effective, sustainable, and scalable. Working in the Indian legislative domain has provided Nandan with a panorama of every other policy domain, and he is now convinced there is no greater managerial challenge than India’s impending urbanization crisis. It is estimated that thirty people migrate from their rural villages every minute to major Indian cities. Six hundred million Indians are expected to live in cities by 2030.With abysmal infrastructure, the cities face a gargantuan challenge. An acute need for skilled professionals, domain experts, and proficient leadership compels Nandan to aim to work directly with local government leaders to design solutions that are sustainable, economical, and scalable in small and medium-sized Indian cities and towns. The focus of most development initiatives needs to shift from the global metropolises to outlying urban populations. Currently, Nandan is a German Chancellor Fellow in Angela Merkel’s office, working on a research project that seeks to institutionalize smart city development. Naad-e-Ali Sulehria (HSI Fellow 2016) will lead a civilian event calling for peace between India and Pakistan in Lahore at the Alhamra Cultural Complex at 6 pm. HSI Managing Director Ronald Bee will be the keynote speaker for the San Diego World Affairs Council North County Annual Meeting in Rancho Bernardo, California. His topic: The Future of Europe after Brexit. The Summer Hansen Institute will host its tenth group of fellows at the University of San Diego in California this summer.